Lark Writes...on books and life: Survive this! I liked Life As We Knew It so I’ll have to check this one out. I like when these types feel real. So do I! And I felt like for the most part this one had that air of authenticity. I like these types of novels too, especially when an author is able to suspend my disbelief over the course of the novel. I am glad you enjoyed this one. I will definitely have to give this one a try. Post-apocalyptic books and the likes are a hit or miss to me but this one sounds like a good one to me. Hopefully my library has a copy. Yeah, not all apocalypse-novels are equal. Some are pretty bad. But this one was very readable and fun. Haha... Yes, stocking up on chocolate is a must! This sounds like a good one to check out. I don't know why, but I love apocalypse novels. You're right, though, the genre is so saturated that you have to choose carefully. 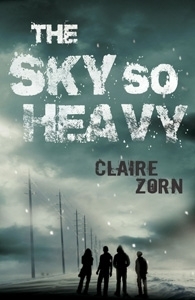 If THE SKY SO HEAVY is as good as TOMORROW and the Pfeffer series, then I'm all over it! Thanks for the rec. I love my apocalypses and enjoyed what I've read of the John Marsden series but I'm always wary of the YA element because of tropes! Seriously, chocolate is the first thing I'd grab :) This sounds good, Lark! Having grown up during the Cold War, I tend to avoid the post-nuclear-holocaust books, but this one sounds well-written and believable. I'm glad you enjoyed it! I really like this genre. I want to read this and will try to get a copy. Did you like Station Eleven? I loved it. Merry Christmas! I haven't read Station Eleven yet, but I've heard good things about it. :) I hope you have a Merry Christmas, too!